Take responsibility for your well-being and master your life. In an earlier article, I wrote about how to approach balancing our masculine and feminine energies through looking inwards and understanding the universal archetypal energies. Today, I’ll look at the more esoteric practice of balancing our etheric, subtle energies. There are a lot of different ideas about how to go about such balancing work. Some approaches are very complex. Personally, I think it’s all rather easy. Read on and I’ll explain how and why. Skeptics among us may dismiss the concept of subtle energies as being unproven, unscientific hogwash. While it’s true that there is not a lot of supporting scientific evidence with regard to subtle energies, some anecdotal aspects are so universal as to be difficult to question. When the concepts of a ‘broken heart’ or a ‘gut feeling’ cross all manner of cultures and languages, spanning the duration of our written histories, it points to a deeper truth. There are energetic mechanisms at play here that science cannot yet observe. Subtle energies are topics that feature richly in both Indian and Chinese ancient healing systems. Yoga, T’ai Chi, QiGong, acupuncture and acupressure all work with subtle energy systems. Chakras, as seen in the lead photo of this article, are nodes of energy within the subtle body. Most systems these days recognize seven chakras, but there are many more. QiGong and T’ai Chi, for example, recognize the palm chakras as being essential in the cultivation and manipulation of energy for both personal energy stores and sensing/working with an opponent’s energy flow (and intention). Yoga is one of the classic practices that work with chakras and subtle energies across the energy channels known as nadi. Some forms of yoga are extremely physical, such as Bikram Yoga or Hatha Yoga. Other forms are more static in nature, such as Sahaja Yoga. The latter works expressly with raising kundalini energy. It is believed that the act of raising kundalini is enough to bring balance to any chakra that has become corrupted in some fashion. Essentially, the idea of chakras as nodes or energy centres in the body is that these points are places where energy is concentrated. Each of these chakras has an associated physical and emotional aspect. Different schools identify each chakra as having slightly different influences, so we won’t really concern ourselves much with the philosophy of what each chakra means. Instead, we’ll focus on knowing when things are amiss and then settings things right again. The simplest means of knowing how well your chakras are doing is to evaluate how you feel overall. Are you healthy? Are you emotionally feeling well? If you’re feeling less than well either emotionally or spiritually, it’s a good indicator that your subtle energy system is somewhat off kilter. Remember: There is no separation between mind, body and spirit. There are only subtle graduations delineating the various systems. Positive and negative effects on any system ripple out to all the others. Even if you’re otherwise feeling healthy, feelings of dissatisfaction, edginess or a chronic anxiety can let you know that you should take some time to get yourself, quite literally, realigned. For example, I’ve been feeling as healthy as usual, with no signs of cold, flu or other illness. That said, I’ve noticed a lingering lethargy and mild feeling of discontent that has been a feature of my day for at least a week now. That is a strong hint that I should take action and restore full wellness to my energetic system. The basic means of restoring balance to our subtle energy system is a combination of meditation, pranayama (focused, regulated breathing) and visualizing/imagining the flow of energy up and down our central channel. For simplicity’s sake, you can just imagine the energy moving up and down your spinal cord. One profound technique for such a meditation is to imagine our body being a bidirectional conduit for energy flowing from heaven to earth and vice versa. We imagine opening up our crown (at the point of our head where it was soft was a baby at birth) and have energy from the cosmos flowing down through the crown and spinal cord, parting at our sacrum to go down our legs, out our feet and then into the Earth. Likewise, we imagine energy from Earth flowing up our feet and legs up into the spinal column and up through our heads and back to the cosmos. This visualization can also feature physical sensations. Some meditators are very sensitive to feelings of flow within the body and experience ‘thrumming’ on a regular basis. This feeling of movement within the body can be actualized and directed. When we imagine ourselves to be a conduit for universal life-force energy, there is remarkable healing potential. As you breath in, focus on the energy flowing from one way or the other. Which way you choose does not matter; whichever feels more natural to you is fine. For me, for example, I am strongly rooted in the shakti (feminine) energy of Mother Earth, so when I inhale, I imagine drawing in the energy through my feet and up through my crown. As I exhale, I imagine my breath drawing down energy from the cosmos. Imagining the flow moving up and down the body is greatly enhanced the more you can invoke physical sensation. As you learn to embrace the concept of flow more and more, you move more energy through your body. 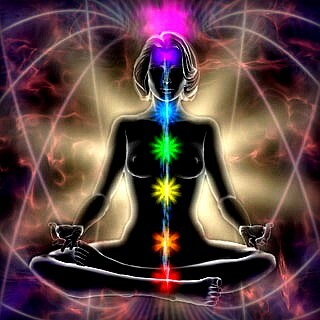 As a result of this flow, you naturally and easily cause the chakras to gain a healthier balance. Chakras that have too much energy within a particular area are reduced and chakras that have been underdeveloped are increased. As chakras regain their balance, we can experience sensations of physical discomfort and emotional outbursts. Emotional outbursts can be sudden feelings of joy or even of sadness. It’s not uncommon during balancing meditation and pranayama to cry or laugh. (And sometimes both.) Be gentle and allowing of anything that happens. Emotional changes strongly indicate that healing is taking place. If you’re more movement-oriented, you may also wish to look into more physical forms of yoga, such as Hatha Yoga or one of the many styles of T’ai Chi and QiGong. Each has their own approach to balancing the energy systems of the body. Classically, QiGong is the most similar to Sahaja Yoga in its direct manipulation and cultivation of universal life-force energy. T’ai Chi effects great flow within the body through its movements and forms, thereby naturally improving the subtle body without the practitioner consciously working towards that goal. It’s worth mentioning again that there’s no separation between mind, body and spirit. If you’re unwell in one area, you’ll have corresponding aspects of unwellness in all others. Likewise, complete wellbeing is complete. Practicing any of the mentioned systems will help you to heal yourself deeply and be in greater control of all areas of your life.